Tantalise your taste buds with the relaxed casual menu at the Oakdene cafe. Mr Grubb @ Oakdene offers an exciting menu of share plates, pizzas, burgers and salads. We are also open for coffee and cake. 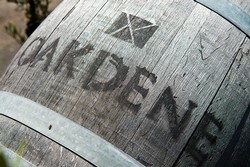 or simply to enjoy a glass of Oakdene wine. You can sit, relax and take in the garden views or dine outside amongst the magnificent birch trees. As an Oakdene Wine Club member you can receive a 10% discount when dining at Marty @ Oakdene restaurant. You are entitled to a 10% deduction off the total bill for the table, up to a maximum of $30. This offer is strictly limited to one Wine Club Membership per party. The 10% restaurant/cafe discount cannot be used with any other offers and excludes public holidays, January, Saturday nights and any special events/offers. We now have our very own Rewards Card. Next time you visit us sign up to the Chichester Restaurants Rewardle system to earn points each time you visit Marty @ Oakdene, Mr Grubb @ Oakdene or the Fork N Flower and then redeem your points to SAVE, SAVE, SAVE.